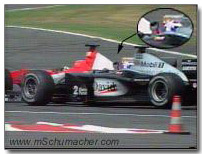 During the French GP of 2000, Michael managed to get Scot Coulthard to lose his cool. Michael had led the race from the start, making the most of his pole position. He had blocked Coulthard from moving past him and simultaneously allowed team mate Barrichello to take second place as a result. Lap after lap ensued with Schuey extending his lead from the chasing pack, with the McLarens following in procession behind Barrichello. Eventually Coulthard managed to pass Barrichello by outbraking him. He then began closing up on Michael after engine trouble slowed Schuey by over 1.5s a lap. When Coulthard summoned the guts to attempt a passing manoeuvre on Schuey, the double world champion closed the door in the most convincing way. Not only did he block Coulthard’s car, but he did so in such a way that required Coulthard to slow down or else run off the track! Make no mistake, this is legitimate race driving tactics and is not unsportsmanlike in any way. It is the perfect method of maintaining your position when a competitor attempts to pass. Showing his immaturity as a driver, Coulthard proceeded to stick his index finger up at Michael and then make a side to side motion with a semi closed fist. Is this the behaviour of a man deserving of the championship? Have you ever seen Michael make such signals? The best advice for Coulthard might have been to keep both hands on the wheel in future – that way he could have had a better chance of beating Michael fair and square. What he may have overlooked was that he was playing directly in Michael’s hands by rising to the bait. 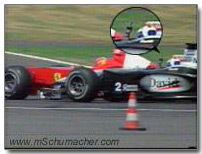 Known for playing psychological games, ever cool Schuey would have noted Coulthard’s weak point.